1. The most obvious- Don’t procrastinate. Sure its boring, but in the end you will take so much pressure off of yourself. For me, studying for multiple subjects in the same day never fared very well. 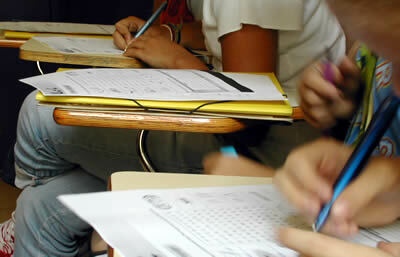 Assuming that you have enough time until finals week, try to study for one class a day instead of cramming them all in. This will help your mind stay organized and keep you from information-overload! Just read over your notes once or twice the night/morning before. 2. It’s okay to take breaks! In high school I had a teacher who told us we better not study for his tests for more than 15 minutes at a time. Was he saying only study for 15 minutes? I WISH! His point was, after awhile you tend to drift off and you are no longer retaining the information. Now some of you may have longer attention spans than others. Find the amount of time that suits you, 15 minutes, 30 minutes, an hour (if you can fully concentrate for an hour without interruption- I applaud you!). Once you have studied for your chosen amount of time, put the books down and walk away. Talk to a friend, get a snack, or just relax for a few minutes (10-15 is probably a good amount). Repeat the cycle until you feel confident for the test! 3. SLEEP!! If you exhaust yourself, you will not perform to your best ability on the test, nor will you be able to focus on studying for others. Perhaps you can use those breaks in your studying for a little snooze 🙂 Use your time wisely so that you can get to bed at a decent time. 4. If you choose to study with a friend, choose the right friend! I always found it helpful to have a friend quiz me or work on homework together, but if you choose the wrong one you will just get distracted. Make sure to choose a disciplined friend who will help you stay on task. I hope you all had a wonderful Thanksgiving (and break)! But alas, it’s back to reality this Monday- which means the final Greek of the Week! Today we tip our caps to the Eta Zeta chapter of Alpha Tau Omega from Georgia Southern University! Eta Zeta recently battled it out to win the prized Greek Cup from GSU. The competition is comprised of athletic events such as Ultimate Frisbee, Flag Football, Basketball, Soccer, and Softball…makes me tired just thinking about it! This chapter earned first place in ultimate frisbee, flag football, and soccer! They also placed 2nd in softball, and 3rd in basketball. 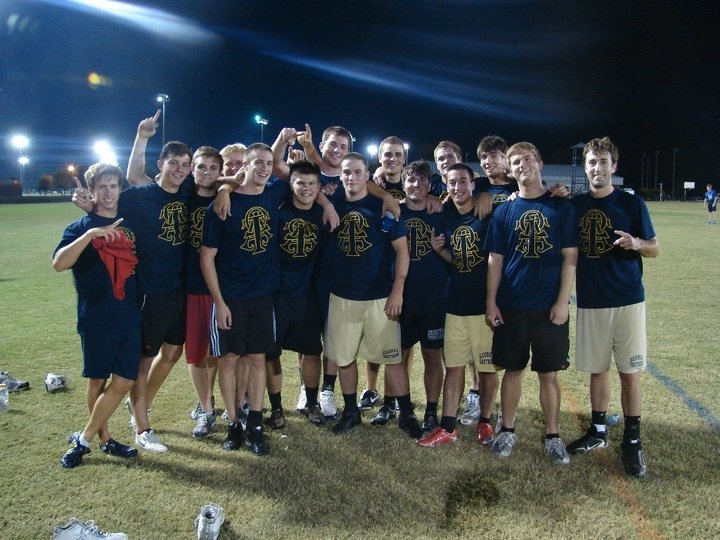 Eta Zeta was able to win the Greek Cup by a landslide and gain some pretty great bragging rights as well! They say they’re not stopping here, prepping for the next competition already! 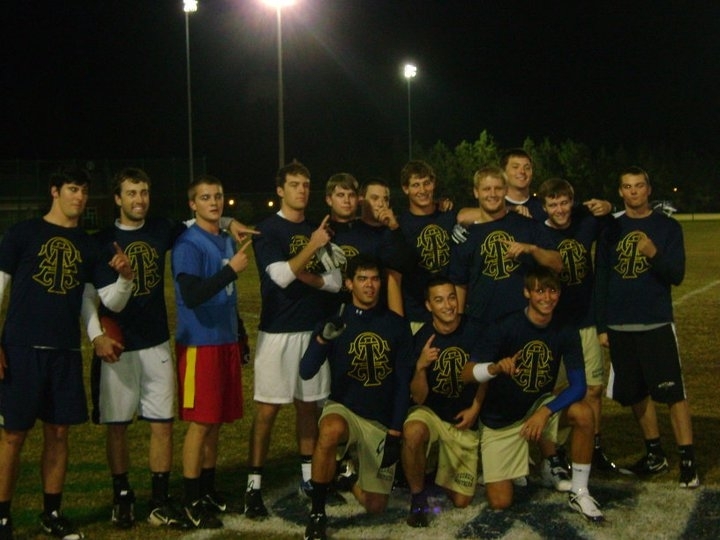 Congratulations to Alpha Tau Omega! Remember, next week begins the official voting for Greek of the Week. The grand prize is a $250 shopping spree to Greekgear.com! Congratulations to all of our winners, keep up the good work! Only 2 weeks left until the final voting round for Greek of the Week! Time flies when you’re having fun! This week we congratulate the Iota Psi chapter of Sigma Chi for their outstanding philanthropic efforts. The Iota Psi chapter proudly resides at Rutgers University. 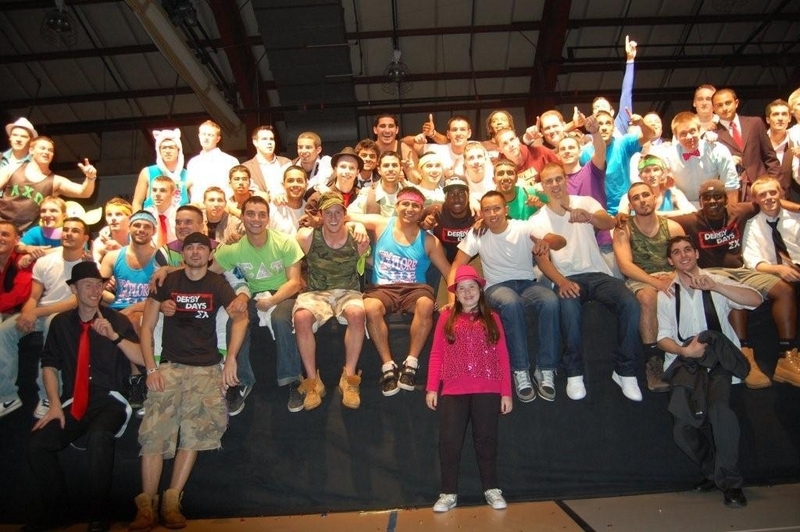 A few weeks ago, they hosted an annual event they call “Derby Days.” The week-long event includes fundraising activities such as Penny Wars, Brotherhood Auctions, a Lip Sync, etc.to raise money for the Children’s Miracle Network and other charities. Now, the event itself would’ve been a great accomplishment but the special part was, they raised $167,000!! No, that is not a typo! $167,000!!! This broke the National Greek Fundraising record, previously held by the same Greek system at $95,000 the previous year. These go-getters aren’t stopping there! They have already set a new goal of $200,000 for next year and say they will continue to do whatever they can to give back to their community. Incredible accomplishment, congratulations to you all! Sigma Chi, Iota Psi is now in the running for the grand prize $250 chapter shopping spree from Greekgear.com! Good luck to you! Looking for some fun philanthropy events for the end of the semester but don’t have much time? There are plenty of things you can put together nicely on short notice! 2. Host a Winter Clothing Drive- Ask your university community to donate new or gently used coats, jackets, mittens, scarves, etc. for the less fortunate. You can find some large boxes to set out in heavily trafficked areas or set-up a donation station for people to drop off their items. Look online or in the phone book to find a local homeless shelter for the donations. Make up some flyers to hang around campus and send out a campus-wide email to promote the event! 3. 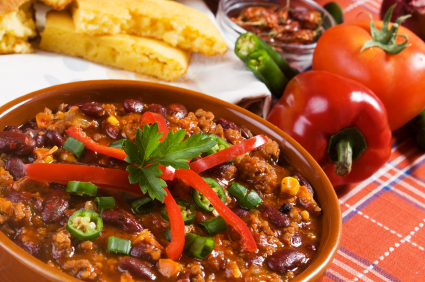 Chili Cook-Off- The perfect event for a cold Fall day! Get together with other chapters on campus and have a culinary showdown! Each chapter can create a different chili recipe, and let the campus be the judge of the best! Set up some tables in a quad, lounge, or cafeteria to host the event. Ask for $0.25 (or whatever amount you feel is appropriate) donations to taste test and vote, and say a $1.00 for a bowl. Simple and fun! The holiday season is full of opportunities to lend a hand. Check with local churches and homeless shelters to find out what they need or if they could use volunteers. Remember, it is the season of giving- what better way to get in the spirit than to give! We want to know- How is your chapter giving this holiday season? Greek of the Week- Sigma Sigma Sigma, Theta Gamma Chapter! Another week, another Greek! 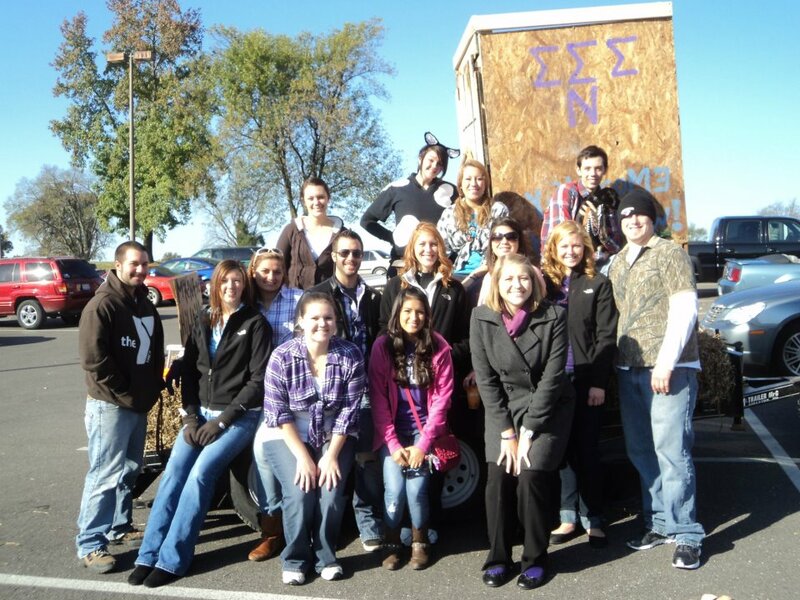 This week we are featuring the Theta Gamma Chapter of Tri-Sigma! The chapter competed in their university’s annual Homecoming Games where they faced “fierce” competition their VP says. Though they had always finished top 3 in the past, they never seemed to achieve that #1 spot! The games ranged from athletic competitions to creative challenges. Going into the final round, Theta Gamma was tied for second place. The tie-breaker? A Homecoming float competition for the annual parade! The chapter won second place in the float, which allowed them to take over as #1! Not only did they win first place in the Homecoming games, their Vice President also won Homecoming queen! They describe the week as “picturesque” and say, “we will forever have great memories of that week.” Congratulations on a job well done ladies! One step closer to a $250 shopping spree! Want a chance to win a shopping spree for your chapter? It’s simple! Just send a brief description of your accomplishment, as well as a picture, to mmark@inarush.com! EVERY ENTRY WINS A PRIZE!! Hurry, there are only a couple weeks left!! Greek Chic- Sip With Style! The weather is getting colder but the drinks are getting warmer! One of the best parts about the fall and winter are the yummy coffees and hot chocolates that the seasons bring with them. Not only are the drinks delicious, but cups can be pretty ‘hot’ as well! Check out our Sorority Cappuccino Mug! These make great gifts or fit perfectly in a chapter house kitchen! 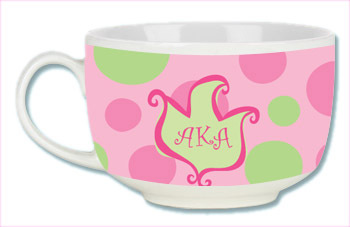 If you are always on the go like me- you might enjoy this Sorority Ceramic Coffee Cup. 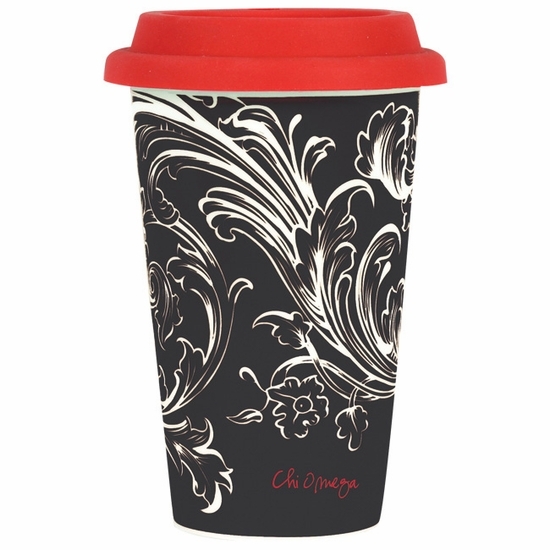 Keep your beverage warm in this double-walled ceramic cup! 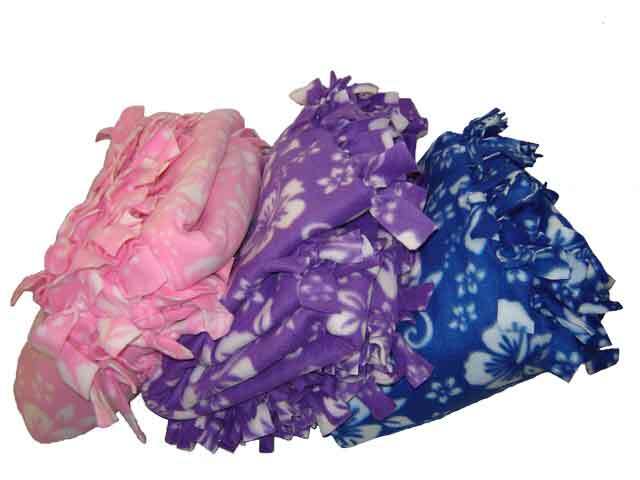 It has a fun design and comes in your organization’s colors! Another option is this cool (..or should I say ‘warm’!) 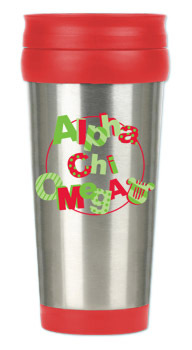 Sorority Stainless Steel Travel Mug. The lid and bottom of the mug change according to your organizations colors. The funky text adds some extra pizazz! Log on to Greekgear.com today and receive 10% off your ENTIRE purchase when you enter “holiday10” at checkout!! Greek of the Week- ALPHA XI DELTA, Iota Alpha! Happy Monday- A new week means a new Greek of the Week! 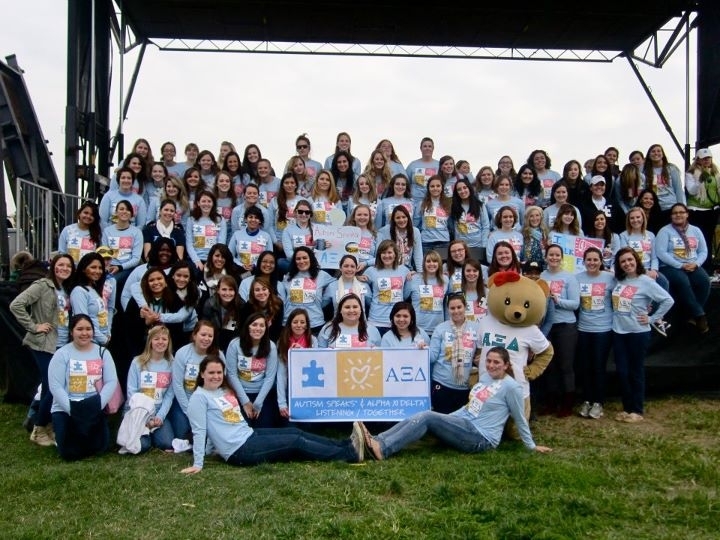 This week we are pleased to congratulate the Iota Alpha Chapter of Alpha Xi Delta for their phenomenal efforts in raising over $8,000 for Autism Speaks! WOW!! Iota Alpha represents George Mason University. Not only did the chapter make an incredible donation to Autism Speaks, they also hosted a carnival for the children. They painted faces and hosted games such as bowling and mini-golf! Sounds like an amazing event, ladies! You are now entered for a chance to win the $250 Greekgear.com shopping spree! If you would like to enter your chapter for a chance to win the shopping spree, simply email mmark@inarush.com with a picture and brief description of some accomplishment your chapter is proud of this semester! EVERY ENTRY WINS A PRIZE!!!! Only a couple weeks left, let’s see what ya got!